Hi, my name is Alex Hightower. 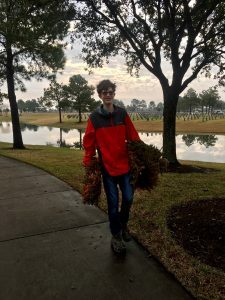 I am a sophomore at The HUB Houston, a relationship-centered educational program serving teenagers and young adults with neurological differences. I am also the webmaster and former Senior Patrol Leader for Boy Scout Troop 609. Our Troop specializes in kids on the autism spectrum. For those of you who don’t know, autism (spectrum disorders) is a general term for a group of complex disorders of brain development. These can cause difficulties in socializing, communication and repetitive behaviors. Some kids with autism have trouble learning, or learn differently. They sometimes need more support and help compared to regular kids. I feel different, and sometimes when I make mistakes, it is very hard to get back on track. Sometimes I have a hard time staying focused, or staying with the group. Because of my Asperger’s, which is a type of autism, communication and social cues affect my relationships with others. This makes leadership very frustrating for me, especially when the rest of my troop has similar communication and social problems. When something bothers me, I lash out and get angry. My brain gets overwhelmed because it has a hard time filtering information which includes processing everything around me. It feels like all of my senses are super sensitive. Sounds are loud and annoying. I can see the flickering of the lights. I hate to be touched. I can’t describe what it feels like, but I just don’t like it. This makes me feel and act very tense all the time. Sometimes my Asperger’s affects my ability to learn. I often mix up the steps. Even though it makes sense to me, my answers come out wrong. I also don’t like using metaphors or similes, they don’t make sense to me. For example when someone says “it’s raining cats and dogs” I often imagine actual cats and dogs falling from the sky. With my Asperger’s, the feeling of being different is very sad to me, but I know everybody is different in the world. Since I joined Scouting, I got to be with people like me. “Different”. But I am always challenged at Scout meetings and during big Scouting events. I joined Boy Scouts in 2011; since then I have successfully earned 37 merit badges, and am in the process of completing the 3 final merit badges required for Eagle Scout. My favorite merit badges have been science and technology focused. I really love Scouting. I enjoy the camping, cooking, games and learning new skills. I also like being able to give back to the community and helping others at all times. Scouting provides a good structure to learn skills to use in the outside world that I am not taught in a classroom. These skills may take longer for me and other Scouts in my Troop to master, but that’s ok. We have lots of good times together. I am actively working on my Eagle Project. In order for me to earn the rank of Eagle Scout, I must complete 13 required merit badges, including citizenship, personal fitness, personal management, and environmental science. In addition to those 13 merit badges I needed to complete 8 more of my choosing out of the 135 available merit badges. The most challenging part of earning Eagle Scout is to plan, organize and implement a project that benefits my community. I always wanted to help others like me. After having the opportunity to travel with my family, I saw how other countries were more accepting of individuals with disabilities. This inspired my Eagle project. I am hoping to create and deliver “Sensory Backpacks” to the Houston Museum of Natural Science by the end of this month. These backpacks will be available for loaning out to kids like me, who sometimes have a hard time focusing, dealing with lights, lots of people and annoying sounds. My goal is to fill the backpacks with items that will help kids cope with these sensory problems like noise canceling earphones, or an easy to read map, or a fidget to help calm them down when visiting the museum. I am in the process of collecting as much feedback about what should be in the backpacks from the special needs community here in Houston. I have made a Google Docs survey (see below if you would like to participate) that I have been sharing on Facebook and through e-mail. Once I complete my project and my final merit badges, I will present it to members of the Scouting community to see if I have earned the highest rank, Eagle Scout. I am not allowing my Asperger’s to hold me back from reaching my goals. I will hopefully also be the first Eagle Scout from Troop 609! I am both excited and nervous about this. Note from Alex’s Mom: Alex, along with his twin brother, Julian, who is also on the autism spectrum, will be turning 17 this week. They are both in Boy Scout Troop 609. 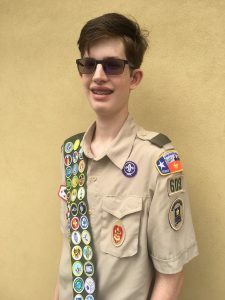 Technology has played a big role in both of their lives, and Alex has done a majority of his Eagle project through online research by communicating to others about it via e-mail and Facebook, and he has even been practicing his letter writing skills. He will be keeping the survey open until Saturday, April 8th. He also plans on spending some time at the Houston Museum of Natural Science trying his best to survey guests, with the help from members of his troop. I am a very proud mom! Alex, it has been a pleasure watching you grow through your scouting experiences. Your Eagle Project will have such a positive impact for the museum visitors with sensory symptoms. Best of luck! Thank you for your comment Pat. We think Alex is pretty awesome too! Alex-We are so very proud of you. An Eagle Scout is not an easy rank to achieve. Those who make Eagle Scout are highly respected. As an Eagle Scout, you will see many opportunities and doors open up for you throughout your life. Please keep us updated on your progress. Wow! Alex that was eloquent and informative! You are making the world a better place!